This week in Jerusalem the girls explored Sisterhood. We began our meeting by reading a beautiful article that appeared in the New York Times last summer. The article tells the story of a group of Jewish Israeli women who sneak Palestinian Arab women out of the West Bank and take them to Tel Aviv to swim in the sea. It is a story of remarkable courage and unlikely friendships. Themes that resonate for the members of Hand in Hand’s first LitClub. The girls were astonished by the bravery of the women and inspired by their acts of courage. They were also stunned to read an American article about the Middle East that discussed real human issues and not just politics. The girls asked each other poignant questions, such as: How are we, as women, responsible for each other? What do all women have in common? What can we do to help women around the world? Although we didn’t solve any major world conflicts today, they decided together the best thing they can do is to continue having these important conversations and to be brave enough to continue to hope for a brighter future. This week our Girls LitClub focused on the girls’ personal emotional responses following an attack such as this and what messages the girls would like to respond with. We spoke at length about the importance of dialogue, confronting hatred, and our personal responsibility to change this kind of violent thinking. 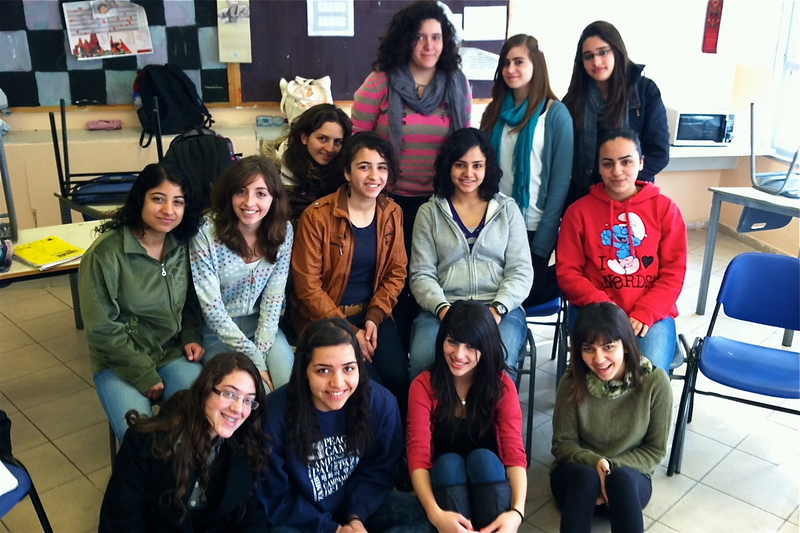 Meet the Jerusalem Girls LitClub! Our dear friend Leah moved to Jerusalem not too long ago, and set up our first Girls LitClub in Jerusalem. It is our pleasure to introduce these young women to the rest of our Girls LitClubs across the world! The girls of LitWorld’s first Israeli Girls Club want to introduce themselves, Jerusalem, and the special school they attend. Hand in Hand: Center for Jewish-Arab Education in Israel is a network of integrated, bilingual schools whose goal is to increase peace, coexistence and equality between the Jews and Arabs of Israel. The club is made up of thirteen 15-year-old Arab girls, who are passionate young women, eager to share their stories and make a difference in their world. Today we wrote about and discussed what it means to be different, our feelings about living in Jerusalem, and the things we want to change in our world. Together we wrote this letter to introduce our club. We live in Jerusalem, a city that is deeply conflicted. There is not only conflict between Jews and Arabs (that’s the conflict everyone knows about), there is also conflict between Christian Arabs and Muslim Arabs, Religious/Conservative Arabs and Secular/Progressive Arabs, Religious Jews and Secular Jews, Men and Women, etc. Of course the conflict between the Jews and the Arabs is the biggest but there are many more problems that people don’t know about. Being a teenage Arab girl in Jerusalem is more difficult than being thirsty in the desert. School is the only place we can express ourselves safely. There are three religions here and we all believe in the same God. We want the world to be more open-minded. Racism hurts and we are surrounded by it every day. We must get rid of our society’s narrow-minded mentality, we must stop the objectification of women, and we must stand up for co-existence. We are different than the society we live in. We attend a co-existence school, we believe in peace. We are different. Sometimes it feels special to be different and sometimes it’s hard. But we believe that being open-minded is important. We can see things differently and bring a new perspective. We need change. We can be the change. Being a part of something special makes you special. So being a part of this makes us special.